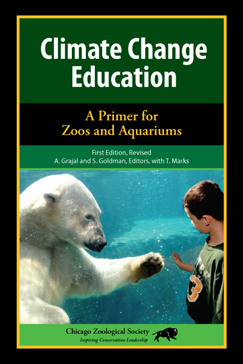 The overarching purpose of the Climate Literacy Zoo Education Network is to develop and evaluate a new approach to climate change education that connects zoo visitors to polar animals currently endangered by climate change, leveraging the associative and affective pathways known to dominate the decision-making of the general public. Utilizing a polar theme, the partnership brings together a strong multidisciplinary team that includes: the Chicago Zoological Society of Brookfield, IL, leading a geographically distributed consortium of nine partners: Columbus Zoo & Aquarium, OH; Como Zoo & Conservatory, St. Paul, MN; Indianapolis Zoo, IN; Louisville Zoological Garden, KY; Oregon Zoo, Portland, OR; Pittsburgh Zoo & PPG Aquarium, PA; Roger Williams Park Zoo, Providence, RI; Toledo Zoological Gardens, OH, and the organization Polar Bears International. The partnership leadership includes the Learning Sciences Research Institute at the University of Illinois at Chicago, and the Earth System Science Center at Pennsylvania State University. The partnership is joined by experts in conservation psychology and an external advisory board. 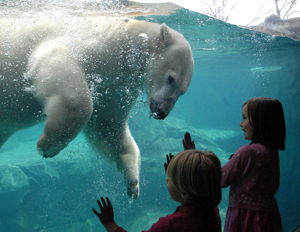 The primary stakeholders are the diverse 13 million annual visitors to the nine partner zoos. Additional stakeholders include zoo docents, interpreters and educators, as well as the partnership technical team in the fields of learning innovations, technological tools, research review and education practice. The core goals of the planning phase are to a) develop and extend the strong multidisciplinary partnership, b) conduct research needed to understand the preconceptions, attitudes, beliefs, and learning modes of zoo visitors regarding climate change; and c) identify and prototype innovative learning environments and tools. Internal and external evaluations will be conducted by Facet Innovations of Seattle, WA. 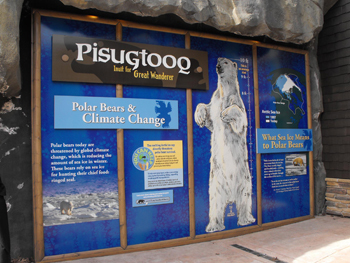 Our long-term vision centers on the development of a network of U.S. zoos, in partnership with climate change domain scientists, learning scientists, conservation psychologists, and other stakeholders, serving as a sustainable infrastructure to investigate strategies designed to foster changes in public attitudes, understandings, and behavior surrounding climate change. This material is based upon work supported by the National Science Foundation under Grant No. 1043284. Any opinions, findings, and conclusions or recommendations expressed in this material are those of the authors and do not necessarily reflect the views of the National Science Foundation. @ 2012 Chicago Zoological Society. All Rights Reserved.